Though many people refer to a variety of beans as Lentils, lentils are actually small, round and flat legumes with a dark brown husk. 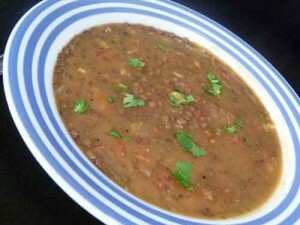 Lentil Soup (or Masoor Daal) is hearty, homey and satisfying. 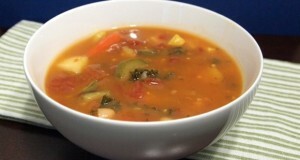 Packed with protein and fiber, this Lentil Soup recipe makes a healthy and filling lunch. Pair it with rice or chapati and you have a complete dinner. Wash Lentil in running water until water runs clear. Soak for approx 1 hour. Drain water. Add Lentil and 3 cups Water in a pressure cooker and cook for 2 whistles. Add Mustard Seeds and Cumin Seeds and allow them to splutter. Add Turmeric Powder, Asafoetida, Onion, Garlic, Ginger and Green Chilies – mix well and cook until onions turn translucent and light brown. Add Tomato – mix and cook for 2 to 3 minutes. 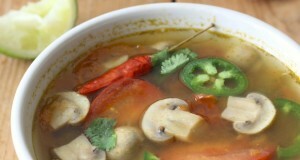 Add Coriander Powder, Cumin Powder and Red Chili Powder – cook for 1 minute. Add in cooked Lentil, Salt and a little extra water if the mixture is too thick. Allow to boil for 2 to 3 minutes. Add Lemon Juice to taste and garnish with Cilantro. 1. Soaking the Lentil for about an hour before pressure cooking reduces cooking time. 2. 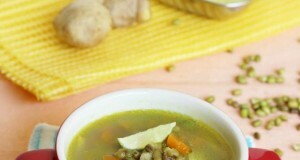 For a creamy variation, add a dollop of yogurt (at the end) to your lentil soup.